The Hopeless Bibliophile: It's the Second Annual Holiday Read-a-Thon! 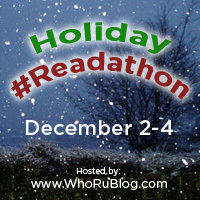 WhoRuBlog is once again hosting the Holiday Read-a-Thon! It will be taking place tomorrow through the fourth. There are no rules regarding what to read, but the host does ask that participants make a either a monetary pledge or a donation (toys, books, etc.) to the charity of your choice. I will be donating some toys to Toys for Tots this year, as usual. (My family started doing this a few years ago, and it's such a great charity!) Click here to sign up for the read-a-thon! This year, I am hoping to get some of my White Christmas books read. Check out my post from earlier today for a list of titles.